Views. Views. Views. From the moment you walk in the door, you will be mesmerized by the views from this 4th floor villa. Directly overlooking the beautiful yachts and water activities of Shelter Cove Harbor, you may never leave your balcony! When you do, you will enjoy the large waterfront pool, nightly entertainment and dining and shopping right outside your villa! 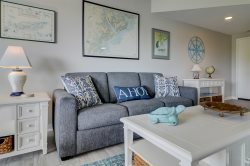 Located just a short bike ride or drive to the beach, this 3 Bedroom villa is comfortably decorated with tasteful, updated furnishings, perfect for a family getaway to the beach! This year I worked with Celcile Eck, I needed to make a last minute change in arrival and departure times and she was very accommodating. Cecile was very professional and personable and as always she had left a little cercee on the kitchen counter for us. This always puts a smile on my face and I know my business is appreciated.